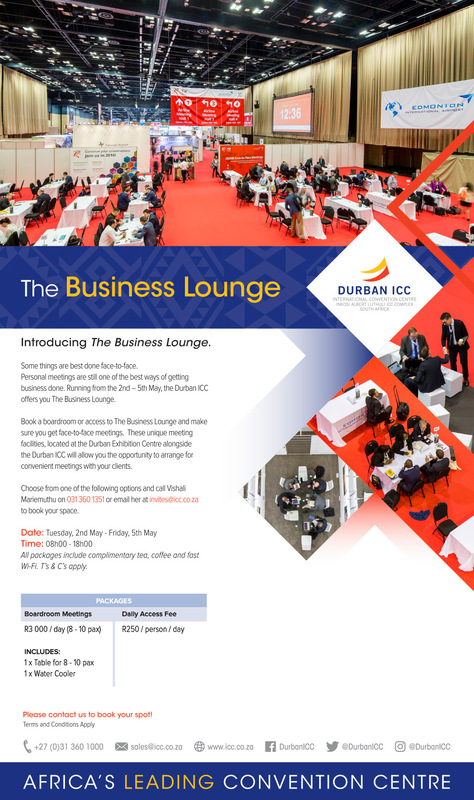 On offer from the 2nd to the 5th May, the Durban ICC is offering a pop-up Business Lounge facility at the Durban Exhibition Centre. Business people can take advantage of the facility with a Day Pass (R250) or can reserve their own 10-seater Boardroom at R3000 for the day. The Lounge will offer a host of conveniences for the busy patrons including meeting areas, complimentary Wi-Fi, Tea and Coffee on tap and a range of catering options available for sale. The Business Lounge operates from 08h00 – 18h00 from Tuesday to Friday and bookings can be made by contacting Vishali Mariemuthu on Tel 031 360 1351 / email: invites@icc.co.za.